Hello everyone! Its been a long time since my last blog update. Unfortunately the blog was blasted to hell by spam. It took a while to clean everything up, so please bear with me. Thank you for your patience! 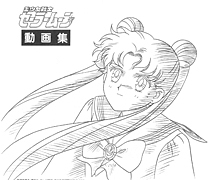 I’m just going to leave some download links here for the new Sailor Moon doujinshi and douga books that were added to the Gallery. Enjoy everyone! Being a fan of Sailor Moon for over 20 years now, I feel like I’ve seen almost all the merchandise that came from the anime and manga. However, I was fairly surprised to learn three years ago, that Sailor Moon had some "secret" books that wasn’t really common knowledge. The books I’m referring to, are the "himitsu" books published by Kodansha for the Sailor Moon anime. Not many people know about these two books, but they are mass produced and aren’t really that rare. "Himitsu" means secret, so its definitely amusing that not many fans know about these two books’ existance. Here is the reason why so few people know about these volumes: It is common knowledge to fans that Kodansha published short hard-cover childrens’ books during Sailor Moon’s run on TV. These hard-cover books are made of board, and have no more than a few pages summarizing the storyline of the anime. Some fans collect these hard-cover books, but most fans do not because they are made to be simplified for pre-school-aged kids. Finally scanned in and uploaded is the douga art book Small Soldier: Unmei no Deai from the doujinshi group Hyper Graphicers. Like previous books that I scanned in from Hyper Graphicers, this is a doujinshi (self-published) book from the animators of Bishoujo Senshi Sailor Moon. 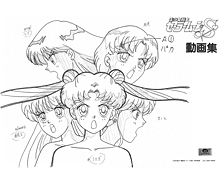 It features douga and genga art work from the Sailor Moon anime. This is Volume 2 out of the four-book collection, and was published in May 1996. Unlike it’s subsequent releases (Lunatic Soldier and Selenity’s Moon), this book is MUCH harder to find and is worth more in monetary value. I finally got my hands on a copy of the Sailor Moon "La Reconquista" Program Book and scanned it in. 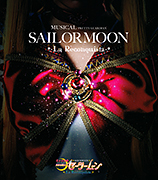 La Reconquista is the Sailor Moon musical for 2013, and features an all-female cast. The program (pamphlet) book for the musical features full-colored high-quality images of the cast members in costume, and even has three new Sailor Moon manga images from the goddess, Takeuchi Naoko. Please enjoy the scans! You are currently browsing the archives for the Sailor Moon Books category.